The Juzo Dynamic Class 1 Almond Compression Tights with Open Toe are made to be as perfect for day-to-day life as possible. Its design means that it gives a great fit, no matter how hard your day goes. The dense knit on the Juzo Dynamic Class 1 Almond Compression Tights with Open Toe makes them incredibly durable and resilient, so they can stand up to your hectic day and keep giving you the compression you need. The tights' seamless design also makes them very comfortable to wear, reducing rubbing and helping to prevent discomfort. The Juzo Dynamic Class 1 Almond Compression Tights with Open Toe are for hip sizes from 90 - 130cm thanks to the highly elastic body part. The RAL compression class 1 gives a mild 18-21 mmHg of compression. Be sure to consult a doctor before using compression tights so you know they're right for you. Measure the circumference of your leg at the applicable points on the diagram (cG and below). Measure the length of the inside of your leg from cG to your foot to find out the length of stocking you need. The product code for the Juzo Dynamic Class 1 range of compression tights and stockings is 3511. 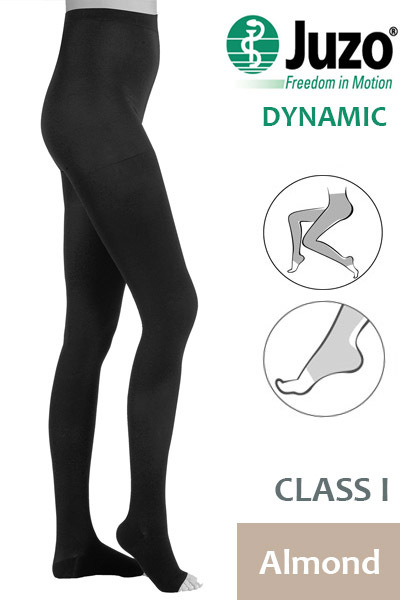 Juzo Dynamic Class 1 Almond Compression Tights with Open Toe are non-returnable and non-refundable on grounds of hygiene. Be sure to consult a doctor before using compression stockings so you know they're right for you. 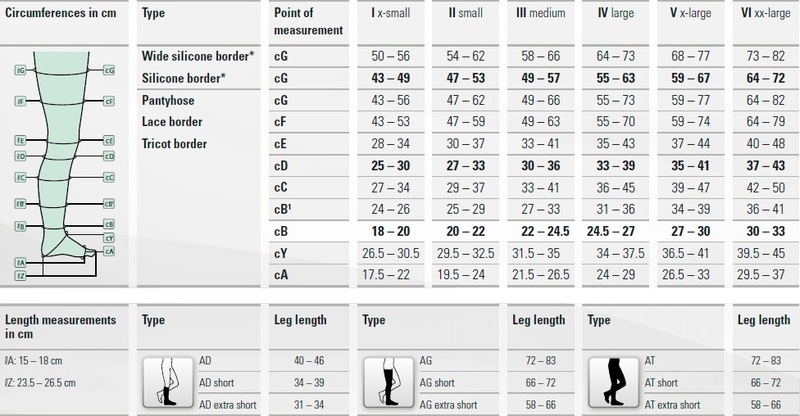 Please use the chart below to find the best possible size of Juzo Dynamic Compression Stocking. Click on the image to see a larger version.